This is the last picture I took of my dad in his home. June 3, 2016, my mom and I brought him home after a three-day stay in the hospital for a mild heart attack. He would go back to the hospital the next morning and would go to his eternal rest less than 24 hours after that. I remember after he drove his power chair up the ramp of his home, instead of going straight through the sliding glass door that leads from the deck into the house, he pivoted to where he could see this magnificent view (that this photograph barely even captures). 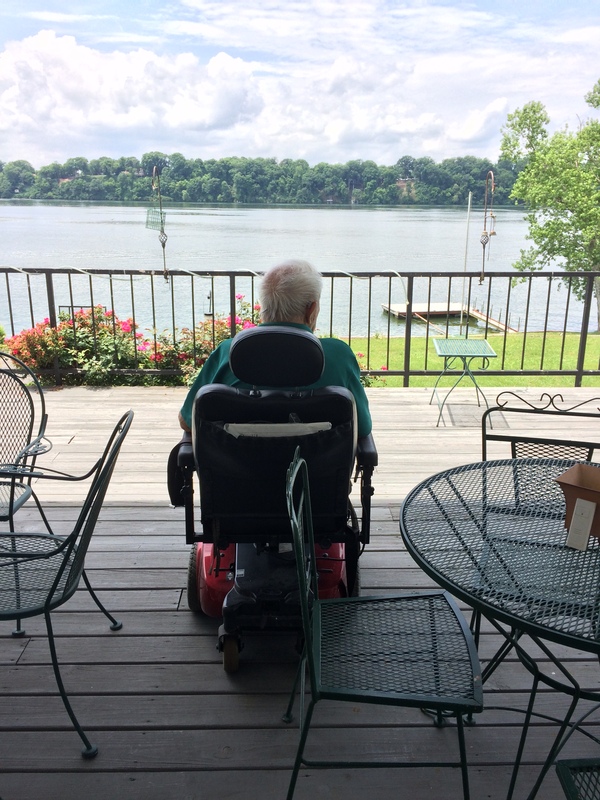 It made me grin to think this was the first thing he wanted to do after getting home from the hospital – take in this view that he had experienced for 60 years. So I tried to capture with a picture one of the things that he loved. As I look back now, on this anniversary of my father’s death, I can’t help but reflect on all the things that he saw in his almost 91 years of life. This particular view of his beloved Old Hickory lake changed almost by the hour. The clouds one can see in this picture would eventually transform into the backdrop for a multi-hued sunset of gray and rose and blues and flecks of gold sparkling on the water. My mother reminds us that every day they woke up and looked outside, the lake provided them a new and different vista. It seems that most every thing my father saw was filled with possibility and new potential. I can hardly remember a discouraging word coming from his mouth. About the only times I remember him raising his voice at me was was for parental guidance that was wholely deserved. However, I do remember him (surprisingly) fussing at his grandchildren on occasion. It was when he heard them say: “I can’t!” He would respond with a firm: “Don’t ever say ‘you can’t. '” And he would leave it at that. I think even as youngsters they got it – that this man who had walked with a brace from the time he was 7 years old, and whom they had witnessed not being slowed down a single step by that “handicap,” was gently reminding them that sometimes it is nothing but our attitude that gets in the way of our achievement. My dad was amazing at seeing things the way they could be and should be, and then figuring out a way to get involved in moving his vision as close to reality as he could. He did that as a PTO dad, as a State Legislator, as a member of the city planning commission, as a leader in his church. He was also amazing at seeing things that would never be and loving them just the same. When Leann and I were expecting our third child I had already decided if it was a boy I was going to name him John Mathias Steinhauer, IV. But I was not naming him after me. I was naming him after my dad. A few hours after Matt was born, and we discovered he had Down syndrome, I was really torn about what my father would think about having a retarded grandchild named after him. I never asked my dad what he thought about that. I didn’t have to. 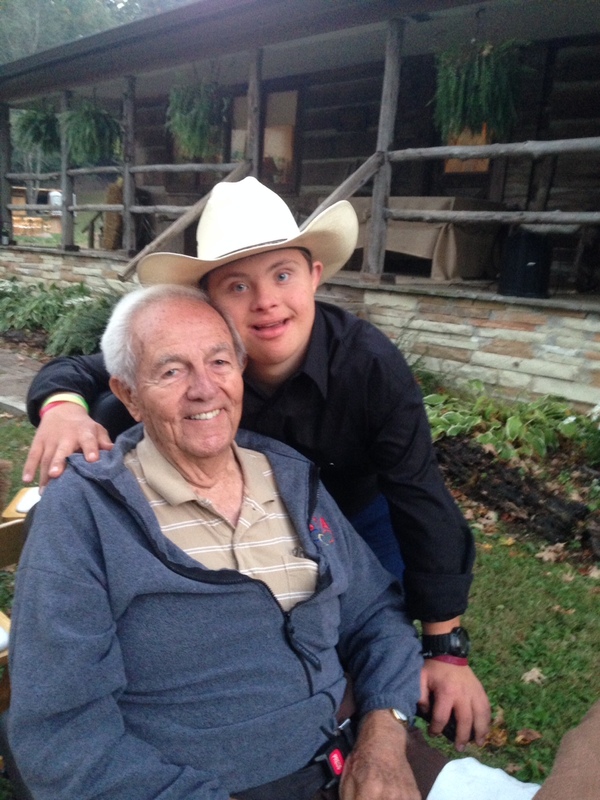 He was always as proud and involved with Matt as any of his seven grandchildren. What he saw was “one of his grandchildren.” He didn’t see the imperfections and obvious differences that the world would see in Matt. If I see half the things my father saw – the way he saw them – I will be OK. This entry was posted in Learning from Life Experiences, Reflections. Bookmark the permalink. I miss him as well. The drives each Tuesday for Sertoma get longer each time A good and a fantastic friend. We all miss him so very much. It seems strange not to see his smiling face at meetings and not be able to hear all the stories that only he knew. He was our hero.